Remy posted a screenshot to Twitter last week. The website is served over HTTPS. My site is. The website has a manifest file. Here’s my JSON manifest file. The website has a Service Worker. Here’s my site’s Service Worker script (although a little birdie told me that the Service Worker script can be as basic as a blank file). The user visits the website a few times over the course of a few days. I think that’s a reasonable set of circumstances. I particularly like that there is no way of forcing the prompt to appear. There are some carrots in there: Want to have the user prompted to add your site to their home screen? Well, then you need to be serving on a secure connection, and you’d better get on board that Service Worker train. I was very much interested myself in this topic, until I checked on the “Can I use…” site the availability of this technology. In one word “limited”. Neither Safari nor IOS Safari support it, at least now, so I cannot use it for implementing mobile applications. I don’t think this is the right way to think about Service Workers. You don’t build your site on top of a Service Worker—you add a Service Worker on top of your existing site. It has been explicitly designed that way: you can’t make it the bedrock of your site’s functionality; you can only add it as an enhancement. I think that’s really, really smart. It means that you can start implementing Service Workers today and as more and more browsers add support, your site will appear to get better and better. My site worked fine for fifteen years before I added a Service Worker, and on the day I added that Service Worker, it had no ill effect on non-supporting browsers. 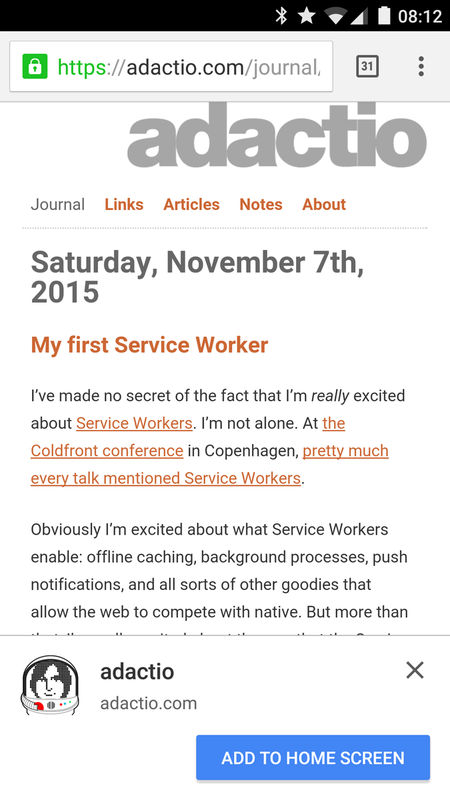 Oh, and according to the Webkit five year plan, Service Worker support is on its way. This doesn’t surprise me. I can’t imagine that Apple would let Google upstage them for too long with that nice “add to home screen” flow. Alas, Mobile Safari’s glacial update cycle means that the earliest we’ll see improvements like Service Workers will probably be September or October of next year. In the age of evergreen browsers, Apple’s feast-or-famine approach to releasing updates is practically indistinguishable from stagnation. The web will always be lagging behind some other technology. I’m okay with that. If anything, I see these other technologies as the research and development arm of the web. CD-ROMs, Flash, and now native apps show us what authors want to be able to do on the web. Slowly but surely, those abilities start becoming available in web browsers. The pace of this standardisation can seem infuriatingly slow. Sometimes it is too slow. But it’s important that we get it right—the web should hold itself to a higher standard. And so the web plays the tortoise while other technologies race ahead as the hare. Critically, these apps can deliver an even better user experience than traditional web apps. Because it’s also possible to build this performance in as progressive enhancement, the tangible improvements make it worth building this way regardless of “appy” intent. What excites me is the prospect of building services that work just fine on low-powered devices with basic browsers, but that also take advantage of all the great possibilities offered by the latest browsers running on the newest devices. Backwards compatible and future friendly. And if that sounds like a naïve hope, then I humbly suggest that Service Workers are a textbook example of exactly that approach. Джереми Кит о том, как предлагать пользователю Android добавить часто посещаемый сайт на Home screen adactio.com/journal/9814. Вообще крутой. @saila there was a keynote talk on these at the NY Velocity conf. Concise and well-done, see if you can find the video maybe. @adactio and a colored navigation bar! @nzgb Yeah, that’s a nice bonus too! @adactio Nice! I noticed the coloured chrome on another site today for the first time. How do you do that? @charlesroper That’s in the manifest.json file. You can subscribe to the journal RSS feed or you can follow @adactioJournal on Twitter. Hand-picked highlights from the archive. Web! What is it good for? Not absolutely nothing, but not absolutely everything either. There is a crack, a crack in everything. That’s how the light gets in. Last night in San Francisco. The opposite of design thinking. The story of how one of my Flickr pictures came to be used in a Hollywood movie.